How does the upkeep work? Can Platinum Emperion prevent Life Effects? I value Dragonlord Kolaghan because she does great job here but I haven't tested new version of the deck much so I'd probably rather let her stay. Also it's haste that can be tutored by creature search and has several other benefits from being a Dragon. Great way to evaluate planeswalkers, thanks for sharing that - I actually told you that I use the last point, namely "What if it sticks for only 1 turn/activation? Is it good enough in that scenario as a modal sorcery or some other spell would be better?" and Sarkhan the Mad won me too many games to skip over him as he perfectly does his job at -4 and then if he stays then great but if not - don't care, he did his job already. On the other hand I'm not so sure about Sarkhan, Fireblood as he needs more testing and moments to prove himself. That new Kiora looks great but... we get back to the problem that I call "3-CMC clusterf*ck" and as you remember that was the reason why we eventually cut Elemental Bond . As for targets to untap... you think in exactly the same way that I did this morning but anything besides Selvala, Heart of the Wilds , Bloom Tender and Mana Vault is not that worth untapping the 2nd time so... why would we keep card that's good for only 3 other cards? Don't get me wrong, she's great but I see her rather in Derevi, Empyrial Tactician deck than here. Strionic Resonator plus mana rocks that produce at least 2 mana together is what makes up Brago's premiere combo. Putting those into the deck, alongside ways to find those cards, will probably improve your deck substantially. Currently, you have 12 mana rocks, but a good number of them are... less than efficient. Talisman of Progress shouldn't be too expensive and is a straight upgrade to any of your 3+ mana rocks (a rock on turn 2 means Brago by turn 3. 2 mana and less rocks are king because Brago's mana cost is 4). Fellwar Stone , Everflowing Chalice , etc., should all be fairly cheap options in the 2cmc range that, when combined together, let you go infinite with Brago and Resonator. The more expensive rocks, like Chrome Mox , Mana Vault , Grim Monolith , Mana Crypt , and Mox Diamond are helpful but not necessary, so for now stick to the good 2cmc rocks that don't enter tapped. 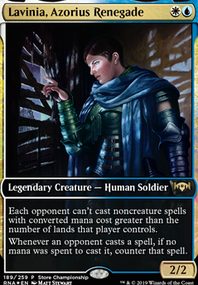 Once you go nuts with Brago and Resonator, you can use Rishadan Cutpurse to make everyone sac all of their permanents. He's actually just decent on his own, oddly enough, so I'd recommend running it over Resolute Archangel (the best way to not need to gain life is to keep your opponents from having anything). Venser, Shaper Savant is fantastic in and out of the combo because he can return a spell to a player's hand as well (so if someone is trying to cast Obliterate or some big spell like that, you can buy a turn by casting Venser, then keep him from getting the mana to cast it again by blinking him and bouncing the caster's land). 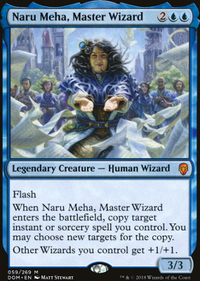 Act of Authority is one of Brago's best cards. The turn you cast it, you can exile two artifacts or enchantments, and then do it each turn thereafter as well. It's pretty handy. It's similar to Reality Acid, which I see you already run. Aura of Silence is perfect for Brago- slow your opponents down, and if they play anything of any value, destroy it. Of course, having ways to find these cards is invaluable, and the single largest boost you could probably give the deck, dollar for dollar, would be in accessible tutors. Fabricate would find Strionic Resonator or Sol Ring, Enlightened Tutor could find you removal (Reality Acid, Act of Authority, Aura of Silence, etc), your Sol Ring, or Resonator, or a stax piece, more on that later. Mystical Tutor could find the aforementioned tutors, draw, protection, sweepers, etc.. Merchant Scroll would find Mystical Tutor or protection. Reshape could be used to find Resonator or Sol Ring. There are more, but these are a reasonable starting point. Lastly, the most competitive way to play Brago? Stax. By stax I mean controlling the board using cards like Winter Orb , Static Orb , Stasis . Stasis is absolutely ridiculous in this deck should you assemble any rock that produces blue (cause you swing Brago, blink himself and the blue producing rock, and nobody gets an untap step ever again). Your opponents can eventually find a way out of this by killing Brago, but it can buy some fairly invaluable turns. Cards like Aven Mindcensor , Cursed Totem , etc., can also slow your opponents down or interfere with integral strategies (Sisay and Yisan, for example, have to find a way around Cursed Totem in order to even play lol). This manner of play is absurdly un-fun, though, so if you have a budget group (which it looks like your deck fits into), I wouldn't recommend playing Brago as stax, and just play basic control until you can find your Resonator and win that way. I've been looking at some other decks, and people have been group-brainstorming ideas for this. Like, down to a science for a total multiplayer combo win in the first few turns. Check out Dango's Proteus Fblthp for a little primer. Isochron Scepter imprinted with Dramatic Reversal is tight - just one mana-rock and you have infinite mana as the Sceptre untaps itself. 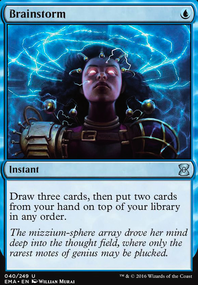 This combo, along with accelerators like Gush and Mana Vault , are the best way to Blue Sun's Zenith everyone for everything. Fraying Sanity and Traumatize to deck someone in one turn. Or bypass that pesky chore of dealing with opponents, and just deck yourself to the win with Tunnel Vision and the all-new Jace. Wielder of Mysteries ! Long_Con So considering I am already assuming that you know the Fblthp, the Lost Proteus Staff line, I will not explain that but for win conditions I was thinking more along the lines of Isochron Scepter dramatic reversal as a way to win, both because it requires less mana, and because it has more synergy with the rest of the deck. The combo works like this... 1. On turn one play an Island and any card. 2. On turn two play an Island and cast Fblthp, the Lost from your command zone to draw a card. 3. On turn three play an Island and then cast Proteus Staff . 4. On turn four play an island and pass the turn either holding up counter manna or activating staff on endstep. 5. Either on end step or on turn 5 (I am going to pretend that you did this on turn 5 for simplicity sake) activate Proteus Staff targeting Fblthp, the Lost do this before you draw your card for turn. 6. Hit Fblthp, the Lost and proceed to stack your deck and draw two cards. 7. The order that you stack your deck from top to bottom is Gush , Mana Vault , Mox Amber , Isochron Scepter , Dramatic Reversal , and the rest is irrelevant. 8. After the Fblthp, the Lost trigger resolves, you will have one land untapped, one land drop for turn, and Gush and Mana Vault in hand. 9. 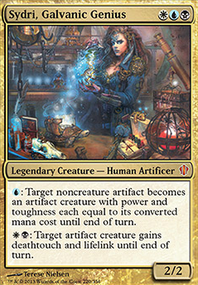 Draw Mox Amber as your card for turn. 10. Cast gush picking up two of your tapped islands to draw Isochron Scepter and Dramatic Reversal . 11. Play one of your gush islands leaving you with two untapped islands. 12. Cast Mox Amber , Mana Vault , and Dramatic scepter. 13. Activate Isochron Scepter an infinite number of times to generate infinite mana. 14. Activate Proteus Staff targeting Fblthp, the Lost until you can draw and cast Blue Sun's Zenith to kill all of your opponents. Great to hear that this deck is fun to play and quite strong. I guess I've just underestimated the value of topdeck manipulation - another trick that I've found out is to play a permament tutor before Vaevictis Asmadi resolves to guarantee value card. 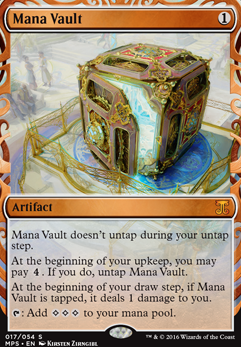 I'm also curious how is Mana Vault performing in your deck so far? Talisman of Progress should replace Pristine Talismam. Generator Servant is also really good here. Strionic Resonator 100% needs to be in here. Copy Artifact can be Strionic Resonator #2 for or it copies a mana rock. Ral Zarek is also handy for untapping Strionic Resonator or Mana Vault type rocks and it only takes a few extra turns to ult. Without full set of fetches I think that you shouldn't get rid of Battlebond duals, maybe besides one, the rest gives at least 1 of the 3 most important colors. Greater Good is a card that I was hestitant to use in this deck - maybe I'm too afraid to lose any value cards, same thing with Wheel of Fortune effects. That's why I'd go for card draw to stick with Jund and there are 2 viable options: Night's Whisper and Painful Truths to not go for 2 black symbols in casting cost. I see however great number of spells at 3 CMC so maybe we should focus on lower CMC draw? Also I like Skyshroud Claim since we can then cast 2CMC spells if there's need to do it. I twice had a chance to cast it T2 off Forest dual and Mana Vault , which then let me cast Fellwar Stone so T3 I had 4 mana aviable and it felt great. Same thing happened with Forest dual and Sol Ring letting me cast Cultivate / Kodama's Reach so I wouldn't cut these ramp spells. About tutors you've mentioned... There's no need to look for specific creatures since we need a way to cast few of them in a turn not much specific one so you're right, pure card advantage spells are better call. However, I wonder if any of the Dragons can be replaced with creature tutor the same way that we did with Enlightened Tutor for Elemental Bond to further lower the Avg. CMC and lower the chances of big cost cards sitting in hands being useless.